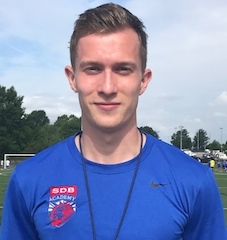 Louis (Lou) Gallagher hails from Croydon, England where he gained a wealth of playing and coaching experience before moving to the U.S to play college soccer. Lou obtained a double major in Finance and Marketing and will begin to pursue his Masters of Science in Organizational Behavior at Avila University in 2017. TAFFS DEVELOPMENT SOCCER SCHOOL - Coached alongside two former football league professionals, coaching elite academy level players in smaller, private sessions. AVILA UNIVERSITY - NAIA, Heart of America Conference. Louis Captained the team his senior year and was part of the team for their first ever HAAC tournament appearance, as well as the best record in 20 years. Louis led the team in goals all four years he played. OXTED SECONDARY SCHOOL - Won the league four of the five years at high school, as well as winning an international schools tournament in Paris, France. Louis lead the team in goals all five years of competition. FULHAM FC YOUTH U11's- U16's - Played for the development academy and academy first team for five years through U11-U16 level. QUINTO ELEMENTO FC- Currently plays for the Kansas State Champions for Adult League Soccer.